A hell of a lot of car for the money, if it sells around the estimate. 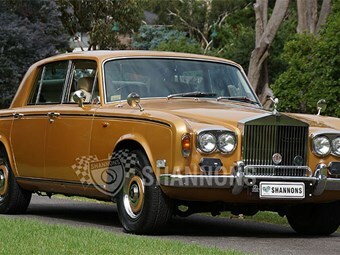 Okay, maybe we're going out on a limb here, but our pick for tonight's auction at Shannons is this, a 1975 Rolls-Royce Silver Shadow. This appears to be the second gen of that series, which means it's running the 6.75lt V8 putting out a relaxed 189hp, mated to a three-speed auto transmission. The cars were largely hand-built over a period of several weeks, so the construction quality is exceptional. Inside the interior is done out in Connolly leather and walnut veneer, so it has a real old-world feel to it. It's as much a mobile lounge room as it is a car. Performance was brisk rather than awe-inspiring. Though very sophisticated for their time, these things are now regarded as pretty straight-forward to work on. The key to success is to stay on top of the maintencance. Otherwise we're talking an undrestressed engine running a GM TH400 transmission, so the main mechanicals really should be bulletproof. The example in tonight's auction (lot 12) has a very good condition report and appears to be a solid fuss-free unit. Given that, the $20-25k estimate seems like a hell of a lot car for the money. If the idea of a Roller spooks you, our next choice might be lot 44, a 1969 Fairlane that needs a little work and has the potential to be a good long-term investment. See the full catalogue at Shannons. Car Shows & Events listing update - send us yours! Here's our regularly-updated events calendar.